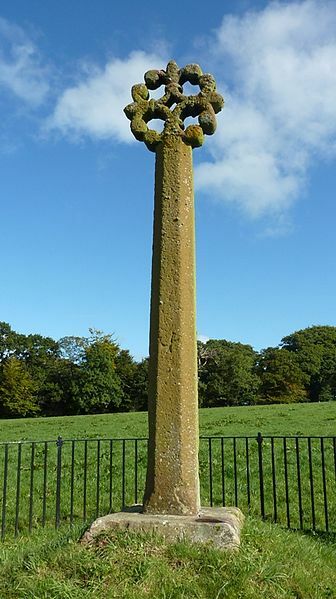 Merkland Cross  Dumfries and Galloway, Scotland. Over a decade ago, the Scottish Tourist Board published a guide entitled Scotland: 1001 Things to See. One of the leaset prepossessing entries was the Merkland Cross. The book said only: Off A-74, at Kirtlebridge, 7 m NW of Gretna. A fine 15th C. floriated wayside cross. At first glance, you might be inclined to put it at the end of your list of things to see while in Maxwell country (Dumfries-Galloway); however, if you are interested in our clan history, you might want to reconsider your decision. Kirtlebridge is where the road crosses the Kirtle Water, a small burn which empties into the Solway Moss, flanked on the east by the River Sark and on the west by the River Annan. The Water of Milk and the Mein Water are tributaries of the Annan which flow down from the hills between the Annan and the Kirtle. The village of Lochmaben lies a mile or so west of the Annan and about ten miles north-northeast of Caerlaverock Castle. At various times, as Wardens of the West Marches and Stewards of Annandale, Maxwells held the keys to Lochmaben Castle. Next to Dumfries, Lochmaben was the major town in the area during the Middle Ages. In 1484, John, Master of Maxwell, eldest son of Robert, second Lord Maxwell, was Steward of Annandale. He was known as Master of Maxwell because his father, while quite elderly, was still alive and John had not succeeded to the Maxwell estates and titles. John Maxwell was probably in his 50s, his parents having been married in 1425. John married in 1454 and sired at least ten children. As Steward, it was his responsibility to administer justice in Annandale. He was answerable only to the Crown. On July 22, 1484, two outlawed Scots, Alexander, Duke of Albany, and James, Earl of Douglas, having mustered a mounted force of some 500 men, crossed the border riding for Lochmaben for the purpose of pillaging the countryside during market days, when most of the populace were in town. Some measure of surprise was attained, and at first things went poorly for the defenders. A reinforcement of royal troops in the nick of time prevented a rout. As the afternoon wore on, the Annandale forces gradually gained the initiative, pushing their enemies back across the Annan. A fighting withdrawal was then made across the Milk and the Mein. At some point, the Master of Maxwell led his men into the fray and they were in the forefront when the English finally broke near the Kirtle Water. John Maxwell had been wounded in the fighting. He dismounted, and leaning against his sword, watched the end of the battle. While he watched, a man approached and stabbed him in the back. John died before anyone could help him. The Merkland Cross was placed at Kirtlebridge to commemorate the slaying of John, Master of Maxwell and Steward of Annandale.